Free - Kellbot! | Kellbot! This week’s topic at weeklyblogpost is ‘free.’ I usually am not a fan of writing prompts because they give me flashbacks to grade school, but somehow I’m ok with the ambiguous one-word topics. Lately I’ve been trying to calculate the cost of free. Specifically in the stuff I give out to promote my business, Tinysaur. A lot of craft shows give out swag bags full of goodies to the first n number of shoppers, and in theory it’s a way to get some “free” advertising. Free as in you didn’t have to pay anyone else for the placement, but it still costs you the time/materials to make the promos. I’m sending out samples rather than promos. There’s a big difference between the two, and I think it’s an important one that’s often overlooked. Promos are little slips of something with your contact information on it. Business cards, buttons, magnets, etc. They don’t really do anything, and frankly I’m not convinced that sending them out carte-blanche is really worth the effort. All those things are pretty cheap, comparatively, but they’re not free. You still have to design/print/ship them, and most of them will end up going straight into the trash. Samples are a different beast entirely. Samples are just that: a sample of your product. Something that gives people a real idea of what it is you make, and why they might want to buy it. It took me a while to come up with a decent idea for a sample. They need to be cheap enough that you can affort free, but nice enough that someone will want to look at them. For two upcoming shows, Not Yo Momma’s Craft Fair and Spring Bada-Bing, I’m sending dinosaur skulls. 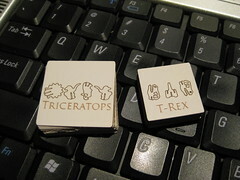 Little sample packs of just the Tinysaur head, pulled from T-Rex and Triceratops. I figure it’s just enough for people to see how small the peices are, punch them out, etc, but still leave them wanting more. The samples are pretty cheap, but there are still some real costs associated with them. I have to pay per-minute for laser time, and while the plastic bags / tags are *practically* free on a per-promo basis, the time it takes to assemble it all adds up. Sure, I don’t have to front any cash for it, but it’s time I could be doing something else, either for my business or for myself. I think it’s important not to mix up “free” and “worthless.” If you’re giving things out, make sure they’re things with some value to them. Information people want, things people can try out, something that will actually get looked at before heading to the recycle bin.